I was up at 5:30 Texas time! It sounds so much better saying it “Texas time.” Ha! You know the whole world evolves around Texans! I had my quiet time, ate a light breakfast, drove to the Hampton Inn for my 4 miles on the treadmill, drove back to the Holiday Inn Express, showered, and dressed for Sunday school. I called the little wife and then drove to Sunday school at the Heritage Baptist Church of Columbus, Ohio. I taught out of the book of Galatians on the subject “The Lines Of Defense.” I then preached this morning on “Why Do I Still Have My Burdens?” God gave us 8 souls and 4 baptisms. It was a great altar call and a great spirit filled service. The Holy Spirit certainly had liberty this morning. I then drove back to Hamilton Road where the motel is located. 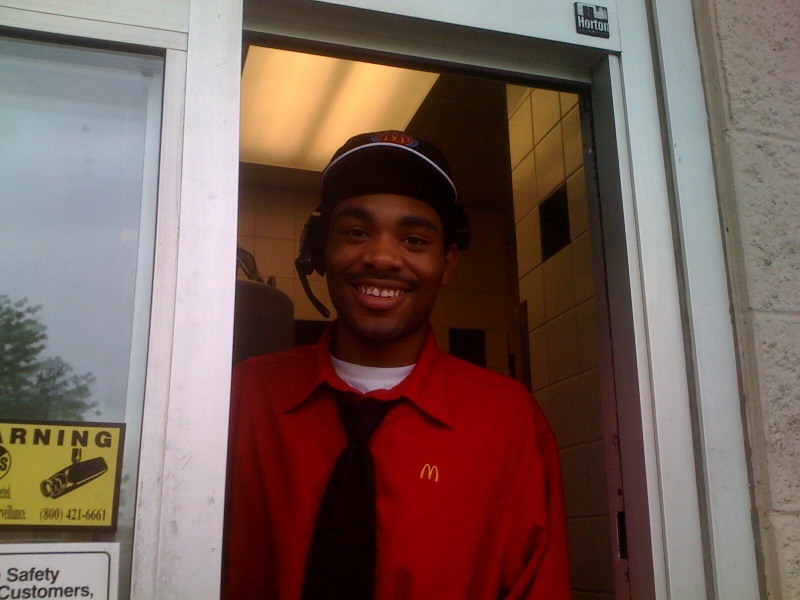 On my way back I went through the drive thru at the McDonalds Restaurant and ordered some snack wraps. I love those grilled chicken snack wraps. Please don’t tell my nutritionist! I just couldn’t pass it up. I ordered and then pulled forward to pay for the meal. No one was behind me and the young man named Aaron Ellis took my credit card for payment. He then began to talk to me about how glad he was that he only had one more hour to go at work. I began to joke with him and soon I asked him if he was going to Heaven when he died? He said, “No, I don’t know!” Within a few minutes he took me by the hand and prayed to receive Christ as payment for all of his sins. It was great! He thanked me! I explained how to get to the Heritage Baptist Church and told him I would only be here for two days. WOW! God is so good! GOTTA LOVE SOUL WINNING! Try it you’ll like it! That's so beautiful! I can't wait to meet him one day in Heaven! !